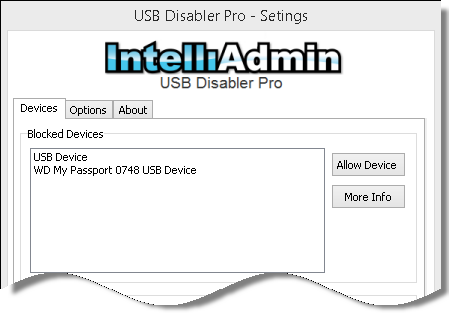 Last week I wrote about some changes we had to make to USB Disabler Pro. We have finalized testing and this week we have a release version ready. This program allows you to keep users from accessing removable storage on their computer. You can allow specific devices, or even setup a group or username that has full access. For a limited time we are offering a site license for only $199 US. Many of you asked about how this compares to the USB Disabler free edition, and its counterpart in Network Administrator. That free tool uses a simple registry key change to block any device that uses the USBStor driver. That worked great for a number of years. All the way back to XP in fact. The problem now is that Microsoft has made some changes in what makes up a removable device. Users can now connect cameras / phones, and copy files to them. All of this without ever touching the USBStor driver subsystem. 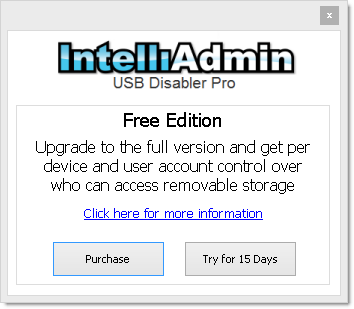 In response to that issue, we have made a free edition of USB Disabler Pro. It works much like the registry key before, except that it can block any type of removable device that can copy files. This new free edition runs as a service, keeps an eye out for new devices and disables them as they are attached. We really appreciate the free edition. We are a non profit and don’t have much $$ to spend on things like this. It will work perfect for our needs. Case workers are trying to bring in things all the time on flash drives, and even their phones. The problem is many times it ends in a bunch of machines getting some type of adware. This will really help in that regard. It’s really a nice tool to prevent storage devices. There is anything to manage such things centrally? I would like to manage our company computers centrally. Can USB Disabler Pro be configured and deployed via group policy or does it have to be installed on each PC individually? Yes, you can use group policy for settings and deployment.